The Mitsubishi Tredia was a subcompact sedan built by Mitsubishi Motors from 1982 to 1990. Its name is supposedly derived from Mitsubishi's "Three Diamonds" logo. Alongside the Cordia and Starion, it was one of the first cars imported and sold to America by the company without the involvement of its then partner, the Chrysler Corporation. Designed to fit between the existing Galant and Lancer models to increase the overall lineup of passenger vehicles, the Cordia and Tredia used front-wheel drive, and were similar in design to the contemporary Mirage. They incorporated a MacPherson strut/independent trailing arm suspension, front disc brakes, manual or electrically-controlled automatic transmission, and a choice of three engines: a 1.4 L rated at 68 hp (51 kW), a 1.6 L rated at 74 hp (55 kW) and a 114 hp (85 kW) turbocharged 1.6 L, which was the first such engine to be sold in Japan. Some smaller export markets also received a carb-fed 2.0 L rated at 110 hp (82 kW). 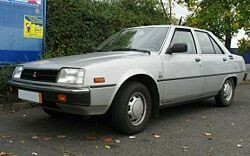 The cars were given a mild facelift in 1983, and four-wheel drive was offered in 1984. The engine range was overhauled in 1985 to allow the cars to run on unleaded fuel, including the introduction of a 1.8 L engine in both 100 hp (70 kW) naturally-aspirated and 135 hp (101 kW) turbocharged form, before production was discontinued in 1990.